September 21 Enterprise Pte Ltd was founded in December 1996 by a group of enterprising people, all with the same vision. The name, "September" was derived from "Autumn" which falls on the Chinese Lunar 8th month. Culturally, the symbol of 8 is an auspicious number. We believe this significant name will bring our company and all our customers, prosperity and luck. This auspicious month is also calm, peaceful and serene. This is what we wish the environment and well being of our company to always be. We are also working towards nurturing the children of today to be the leaders of tomorrow. When the Company was formed, it was still the 20th century but quickly approaching the 21st Century, hence our company name "September 21". We specialise in Early Childhood and Primary School teaching resources. 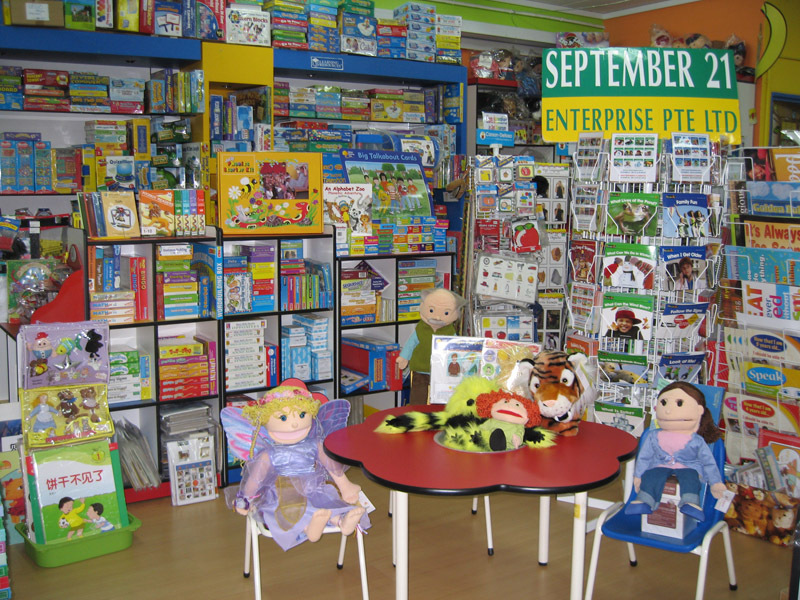 Our important customers include leading bookstore chains and toy stores such as Times The Bookshops, MPH, Kinokuniya, Newslink, Toys R Us and Nurture Craft. We have special displays of our teaching resources at the bookstore outlets of Educational Institution such as NIE and SIM. We are proud to be one of the sourcing agents of the educational resources for the MOE kindergarten framework’s Pilot Project conducted in a number of PCF and NTUC centres for 2001/2. This highly successful project is now being used as a model plan and adopted by many aspiring centres. We service childcare centres chains such as NTUC, Little Skoolhouse, Kinderland, YWCA, Metropolitan YMCA, PAP, PCF, and other educational centres all over Singapore. We provide resources such as teacher reference, books, toys/games, decoratives, school furniture, indoor & outdoor playground equipment as well as book prizes, Gift vouchers, Children day & Christmas gifts. We have customers from Malaysia, Brunei, Indonesia, Thailand, Hong Kong, China and Australia. We assist institutions and centres to set up their libraries and resources need for the training of early childhood educators. We provide resources such as books, toys/games, teaching manipulatives, audio/visual and textbooks. We provide Corporate discount cards for training centres. Please call for more information. We organise book fairs and exhibitions in popular shopping centres, companies, schools, childcare centres, community centres, MOE premises and other specially organised events and exhibitions. We take part in early childhood seminars & conferences where the range of our resources is very popular with the participants. Consolidator for the Disney Pavillion at the World Bookfair held in June 2000. We also organise seminars and talks for parents and teachers during special occasion and for our regular products. Our popular speakers from Australia and US regularly appear on the radio show of “Class 93.5”in the "Living Room" segment. Our fully equipped seminar room come with the latest Interactive “Smart board”, projectors, white screen, all audio/visual equipment and can seat up to 40 persons. The seminar room is available for rent to anyone who wishes to hold a workshop or meeting room for a small group of up to 30 persons at a comfortable cost. We started this Privilege membership club for our loyal customers in 2001. Members are informed of the activities and promotion through our e-quarterly newsletter. Members enjoy special privileges such as invitation to our warehouse sales, great discount and special promotions, priority to register for our workshops and seminars. We provide this service in denominations of $10.00 onwards. They make great door gifts, prizes, loyalty rewards or simply teacher appreciation gifts!